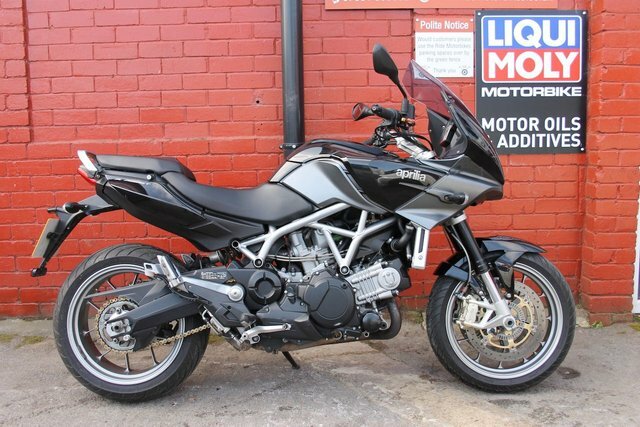 2012 12 APRILIA MANA 850 GT ABS A Very Rare Auto Bike, Delivery and Finance Available. Here we have a very rare Aprilia Mana 850 GT in black, 20K on the clock. FSH. All her keys and booklets, plus receipts and Mot certs. Finance deals tailored to your budget and circumstance. UK delivery from £100. She will leave us with a full PDI, Service, 12mth Mot and a 3mth Ride Warranty. Nationwide extended warranties are available at reasonable prices. The Mana id an automatic bike that really packs a punch. You have the ability to change gear on a paddle or with your foot. But there is no clutch lever. There are rider modes, ABS is installed and heated grips. She also benefits from a Leo Vince can which gives her a lovely note. They have a short wheelbase and handle lovely on the twisties. MCN give them a very positive review. This is a bike you can really enjoy and stand out from the crowd with. Not many for sale in the country. Ride is a friendly down to earth business with a passion for biking. Nationwide Delivery, HPI Clear, PX Welcome, Friendly Customer Service. 01535 658811 ***Check out our customer reviews on the website, at Ride Motorbikes Ltd Facebook page/Autotrader shop and google*** For more information about us, the bike and our stock please visit our website. The adventure starts here! Open 7 Days A Week Ask us about Locks and Chains, Datatags, Helmets and Heated Grips. Stay warm and secure with Ride.